St. Petersburg, Florida -- An Allegiant Air flight from St. Petersburg to Pittsburgh was forced to return Wednesday afternoon after the jet developed a problem with pressure. Flight 866 developed the problem soon after departure. The plane landed safely and passengers are being unloaded. "At Allegiant, the safety of our passengers and crew is always our number one priority. Flight 866 with scheduled service from St. Petersburg-Clearwater International Airport (PIE) to Pittsburgh International Airport (PIT) departed at 4:08 p.m. local time and returned at 5:07 p.m. due to a maintenance issue. Our maintenance team is evaluating the aircraft at this time. We are working now to determine next steps for rescheduling the flight and to accommodate passengers." This is the second time in a little over a week that an Allegiant flight leaving the St. Petersburg-Clearwater Airport and had to return due to an issue with the plane. Major John Capra with the 128th Air Refueling Wing tells FOX6 News the KC-135 aircraft was out on a routine mission on Wednesday morning, and was returning from delivering troops to the United Kingdom. About an hour and 30 minutes from Mitchell Airport, as the plane was headed into Milwaukee, the aircraft’s crew noticed a warning on a gauge on the aircraft’s dashboard — related to one of the four jet engines. An in-flight emergency was declared. As a precaution, one of the four engines that powers the aircraft was shut down in an effort to not damage the engine in question while in flight. The crew brought the aircraft into Milwaukee under the power of three engines. Major Capra tells FOX6 News the aircraft could fly with just one of its four engines if need be. 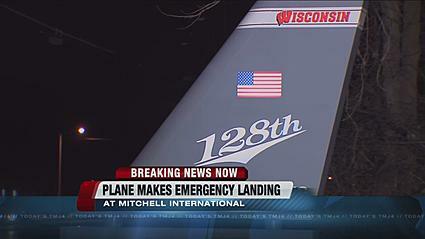 Just after 11:15 a.m., the plane landed without incident at Mitchell Airport. The plane was then impounded, and it will be inspected by the 128th Air Refueling Wing’s quality assurance crew before jet engine technicians inspect it. Major Capra says 128th Air Refueling Wing flight crews take part in multiple training sessions every year to prepare for the various scenarios that could arise while in flight. During the takeoff roll from the 1,400-foot-long runway, the airplane encountered water on the runway and "was not able to gain enough momentum." During the initial climb the airplane was unable to clear the surrounding trees. Therefore, the pilot elected to maneuver the airplane in order to avoid striking the trees. During the turn, the airspeed decreased and the pilot made an off airport landing to a nearby golf course. According to a witness, the airplane was about 40 feet off the ground when it began the turn. In addition, it looked like the airplane "turned too tight," and that the "wings never leveled out" prior to impacting the ground. During the off airport landing, the airplane incurred substantial damage to the left wing and fuselage. The pilot reported no preimpact mechanical malfunctions or failures with the airplane that would have precluded normal operation. He further stated, "it was my fault, not the [airplane's]." At the time of the accident the wind was from the northwest at 4 knots. Pilot's failure to maintain airspeed while maneuvering during the initial climb, which resulted in a loss of lift and subsequent off airport landing. Contributing to the accident was the pilot's failure to abort the takeoff after recognizing the airplane's slow acceleration. During the takeoff roll from the 1,400-foot-long runway, the airplane encountered water on the runway and "was not able to gain enough momentum." During the initial climb the airplane was unable to clear the surrounding trees. 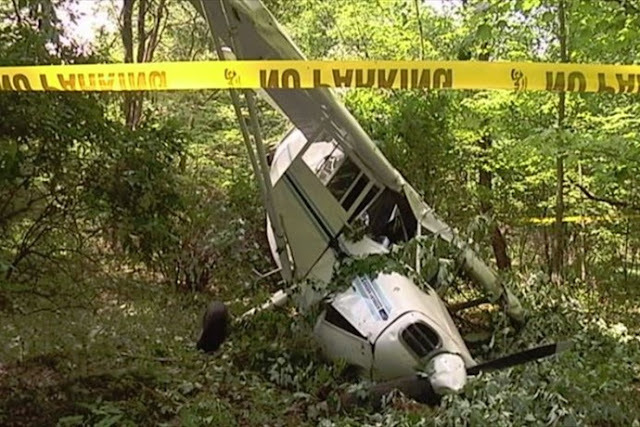 Therefore, the pilot elected to maneuver the airplane in order to avoid striking the trees. During the turn, the airspeed decreased and the pilot made an off airport landing to a nearby golf course. According to a witness, the airplane was about 40 feet off the ground when it began the turn. In addition, it looked like the airplane "turned too tight," and that the "wings never leveled out" prior to impacting the ground. During the off airport landing, the airplane incurred substantial damage to the left wing and fuselage. The pilot reported no preimpact mechanical malfunctions or failures with the airplane that would have precluded normal operation. He further stated, "it was my fault, not the [airplane's]." At the time of the accident the winds were from the northwest at 4 knots. 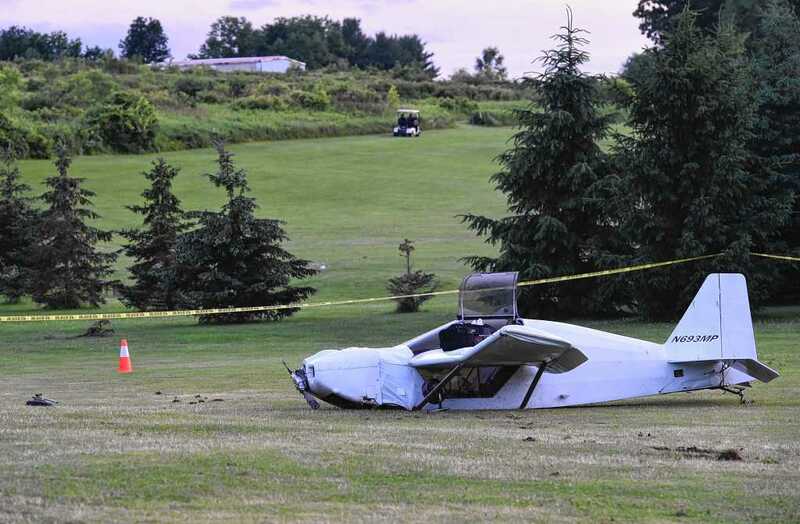 KIRKVILLE, N.Y. -- A single-engine plane crashed Monday evening near the second hole of a Kirkville golf course, according to Onondaga County 911. At 7:18 p.m., someone called 911 to say a plane had crashed at Poolsbrook Golf Course, 6241 N. Poolsbrook Road in Kirkville. Kirkville and Fayetteville volunteer fire departments and Onondaga County Air 1 responded to the scene. The pilot, reportedly a 52-year-old man, is alive and not trapped, according to 911. The pilot complained of neck and back pain, officials said. The North Little Rock Municipal Airport and the Camp Robinson airfield are considering getting on the same wavelength in the interests of safety. One is a civilian airport and the other is an Arkansas Army National Guard airport. They have two separate and distinct missions but are separated by just 2.5 miles. But pilots at the respective airports cannot communicate with each other because the airports use different radio frequencies. Officials at both airports believe that if the airports shared the same frequency, it would increase safety for pilots. “Our concern is we never want to see somebody hurt,” said Maj. Stephen Brack, who is an instructor pilot for the Sikorsky UH-60 Blackhawk helicopters based at Camp Robinson airfield. The aircraft is a twin-engine, medium-lift utility helicopter. Brack and other pilots spoke at a public hearing the North Little Rock Airport Commission held last week to allow pilots to voice their support or objection to a proposal to have both airports use a new radio frequency that only they would share. The commission is scheduled to vote on the proposal at its regular monthly meeting Thursday. Both airports lack an air traffic control tower, unlike larger airports such as Bill and Hillary Clinton National Airport/Adams Field, which is on the south side of the Arkansas River. The controllers in the tower use vocal communication, radar and other equipment to control aircraft in the vicinity of the airport as well as on the airport’s ramps, taxiways and runways. Most small airports, such as North Little Rock and Camp Robinson, don’t have enough traffic to warrant a control tower. Without controllers advising them of the positions of other aircraft, pilots at small airports rely on announcing their own positions and intentions on the airports’ respective radio frequencies to keep fellow pilots informed. Special circumstances at the two small airports north of the river call for closer coordination and a radio frequency only those two airports can share, proponents of the change say. Bob Connor, a retired airline pilot who has been flying out of North Little Rock for the past six years, said airspace restrictions often require pilots at North Little Rock to take off to the south and turn to the west. Flying to the north often has to be restricted whenever military training is taking place on a large swath of Camp Robinson property. Last week, for instance, mortar training was conducted at the camp. Mortars fire explosive projectiles with short ranges but high arcs, with their projectiles reaching 5,000 feet or higher, well within the altitudes of the small aircraft that use the North Little Rock airport. To the south is Clinton National airspace, which many pilots of small planes avoid because it is controlled by the Clinton National controllers. Some aircraft based at North Little Rock that go west fly in the vicinity of the Camp Robinson airfield, where training and other missions are conducted, often right over the field. Brack said that three times in the past year, he has been in a helicopter on final approach to Camp Robinson while practicing an emergency landing procedure using autorotation — which allows a helicopter to land without engine power — when he has had to abort the approach because of conflicts with aircraft from the North Little Rock airport. Lesser conflicts are almost a daily occurrence, he added. “What ends up happening, I’m standing on the ramp, as recently as today, there was an airplane that could not have been — it must have been at pattern altitude or slightly above it — but transitioned right over the center of the airfield with one aircraft getting ready to take off from our ramp and enter the traffic pattern and another a few minutes before that had departed,” Brack said. Jerry Holmsley, who has been flying in and out of the North Little Rock airport for 30 years, agreed with Brack. “I think as a safety issue the folks at Camp Robinson are spot on, that we absolutely without a doubt need to be on the same frequency,” he said. Harry Barrett, the longtime owner of Barrett Aviation, which services general aviation aircraft and offers flight training at the airport, opposed changing the airport’s frequency, which is at 122.8, the common traffic advisory frequency for many small airports. When the new airport at Conway opened, it used a different frequency than the old airport. “Right now, they are still having confusion over at Conway because they’ve changed their frequency,” Barrett said. He also said that because other small airports in central Arkansas share the frequency, it is easy to keep track of traffic at other airports, especially when a pilot might be flying to them. But to other pilots, that radio traffic they hear from other airports is a distraction. “Sitting on the ground … you can’t hear all of the radio calls. But at 1,200 feet in the air, at pattern altitude, you hear the whole state. Connor’s research shows that there were nine airports within 40 miles of the North Little Rock airport that shared the 122.8 frequency. Brack said that clutter was why Camp Robinson wanted a “discreet” frequency that only the two airports would share — 123.075 has been proposed. 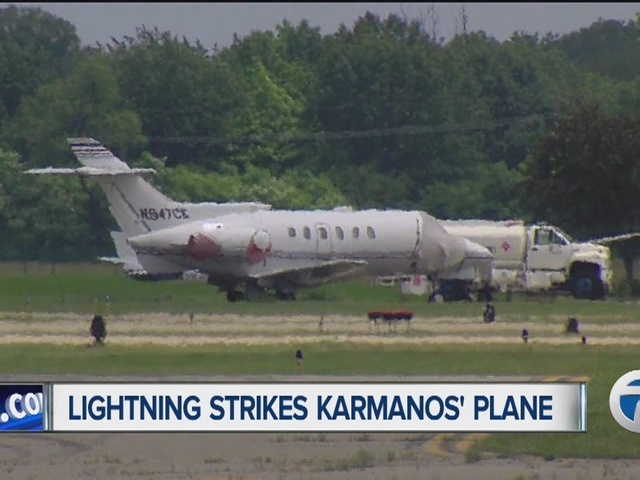 WATERFORD, Mich. (WXYZ) - A plane carrying members of the Karmanos family was forced land at Oakland County International Airport after lightning struck the plane and caused a fire. 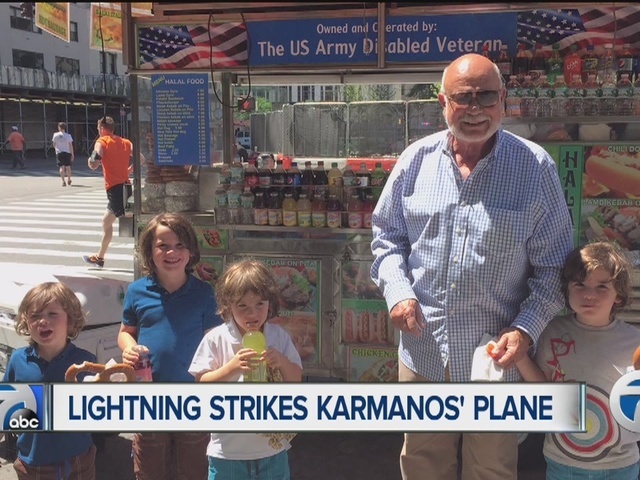 According to Danialle Karmanos, they took the kids to New York to see the Lion King for their end of the school year tradition. She said about 15 minutes outside of Detroit, lightning caused an electrical fire. Danialle said there were two pilots on board, along with one flight attendant, herself, her husband Peter and their four boys. Luckily, no one was injured. According to Peter, two circuit breakers blew, and his young sons noticed a fire in the cockpit. 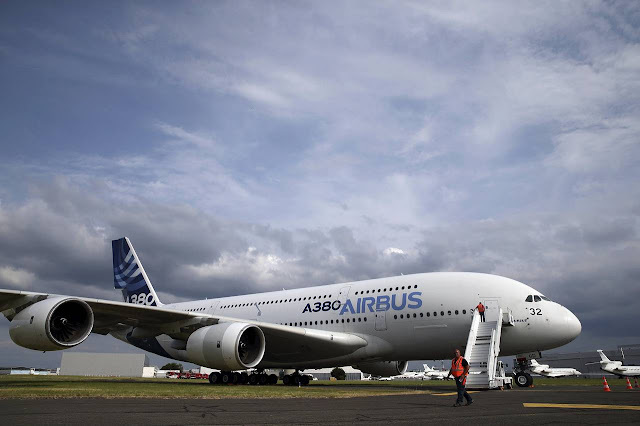 LE BOURGET, France—Airbus Group SE and Boeing Co. kicked off the Paris Air Show on Monday as they combined to win more than 200 jetliner orders before midday. With its first order, Airbus also introduced a new plane model, the A330-300 Regional, a widebody passenger jet optimized for shorter routes. Saudi Arabian Airlines said it would take 20 of the planes as part of a 50-jetliner order. The A330-300 Regional, able to carry as many as 400 passengers on flights up to 3,000 nautical miles, is designed to allow airlines transport a large number of passengers on short routes where seating capacity on single-aisle planes isn't sufficient. John Leahy, Airbus’s commercial-aircraft head of sales, said there was “significant market opportunity” for the plane and that Chinese carriers are also likely buyers. Director General of Saudi Arabian Airlines Saleh bin Nasser Al-Jasser said the plane would allow the carrier “to expand our domestic and regional network and better absorb growing passenger traffic.” The first plane is scheduled to be delivered in 2016. State-owned airline Garuda Indonesia said Monday it would buy aircraft from both Airbus and Boeing. Garuda Indonesia said it has struck a deal for with Boeing for 60 aircraft valued at $10.9 billion at list prices. The Asian carrier said it would buy 30 of Boeing’s fuel-efficient widebody 787-9 Dreamliner and a further 30 737 Max single-aisle jets to expand its domestic market and launch new destinations internationally. “We are concentrating on the most efficient aircraft that can support our business in the future,” Arif Wibowo, president of Garuda, said at a news conference at the Paris Air Show. Airbus said it also signed a letter of intent with Garuda for 30 Airbus A350 long-haul jets that compete with the Chicago plane maker’s Dreamliner. “We are concentrating on the most efficient aircraft that can support our business in the future,” Arif Wibowo, president of Garuda said at a news conference at the Paris Air Show. The 787 will begin delivery to Garuda in 2020 while the 737 Max will hit the airline’s fleet two years later in 2022, Boeing said. Mr. Wibowo added that the 787-9 would be used to enter the U.S. market, without providing further details. Boeing also announced that Taiwan’s EVA Airways plans to buy 777 cargo jets with a list price value of more than $1.5 billion, though customers generally get discounts. Airbus’s also secured a deal from General Electric Co. ’s aircraft leasing arm GE Capital Aviation Services, or GECAS, for 60 A320neo single-aisle jets, doubling its commitment to the new plane now in flight testing. Separately, Airbus announced that Air Lease Corp. has bought additional planes, adding three A320 single-aisle jets, one slightly larger A321 narrowbody, and one A350-900 long range plane. On June 14, 2015, about 1119 central daylight time, a Grumman American Aviation Corporation model AA-5 airplane, N6552L, was substantially damaged when it impacted terrain shortly after takeoff from Gillespie County Airport (T82), Fredericksburg, Texas. The private pilot sustained serious injuries and his passenger was fatally injured. The airplane was registered to a private individual and operated by the pilot. Day visual meteorological conditions prevailed for the local flight that was originating at the time of the accident. According to the pilot's spouse, about 1115, the pilot called her and stated that he and the passenger/mechanic had completed an annual inspection of the airplane and were going on a local flight in the airport traffic pattern. There were no witnesses to the accident. The main wreckage was subsequently located by the property owner about 1245. The wreckage was located in an open pasture with no trees or other obstructions in the general vicinity of the accident site. The wreckage was located along the extended centerline for runway 14, about 1/4 mile from the departure threshold. The aircraft wreckage was orientated on a 350 degree magnetic heading. The airplane had impacted in a nose-down attitude. There was no appreciable wreckage propagation from the point-of-impact. The main wreckage consisted of the entire airframe, including all structural components and flight control surfaces. Flight control continuity was established from the cockpit controls to the rudder and elevator surfaces. Flight control continuity for the right aileron was confirmed; however, there was a torque-tube separation for the left aileron that was consistent with impact damage. The wing flaps appeared to be in the fully retracted position. The fuel system contained tank damage and several line separations that were consistent with impact damage. A first responder reported that the cockpit fuel selector was initially found in the RIGHT position and that, during rescue efforts, he turned the fuel selector to the OFF position. There was fluid present in both supply lines to the fuel selector assembly. The outflow line from the fuel selector was found fragmented. The fluid collected from the right tank supply line was consistent in color and odor to 100 low-lead aviation fuel. There was no water or particulate contamination in the sample collected from the right tank supply line. The fluid collected from the left tank supply line contained a mixture of fuel and water contamination. The electric fuel pump, the lowest point in the fuel system, contained a mixture of fuel and water contamination. The fuel pump filter screen was corroded and was partially obstructed by particulate contaminates. The engine remained partially attached to the firewall by its mounts and control cables. Mechanical continuity was confirmed from the engine components to their respective cockpit controls. Internal engine and valve train continuity was confirmed as the engine crankshaft was rotated. Compression and suction were noted on all cylinders in conjunction with crankshaft rotation. The spark plugs were removed and exhibited features consistent with normal engine operation. Both magnetos provided spark on all leads when rotated. There were no obstructions between the air filter housing and the carburetor. The carburetor fuel bowl contained trace amounts of a fluid that was brown/tan in color, had an odor consistent with aviation fuel, and tested positive for water contamination. Several water droplets were observed to drain from the number 2 engine cylinder when the lower spark plug was removed. The propeller remained attached to the engine crankshaft flange. The propeller blades exhibited aft bending, chordwise scratches, and polishing. The postaccident engine examination revealed no evidence of a mechanical failure that would have precluded normal operation. At 1115, the T82 automated surface observing system reported: wind 170 degrees at 7 knots, broken ceilings at 2,100 feet above ground level (agl) and 2,700 feet agl, 10 mile surface visibility; temperature 26 degrees Celsius; dew point 21 degrees Celsius; and an altimeter setting of 29.93 inches of mercury. A handheld GPS device, recovered from the wreckage, recorded an alert message (an interruption of external power) at 1119:38 (hhmm:ss). The handheld GPS device was not configured to record historical position/track data. A second GPS device was recovered from the wreckage and was retained for additional examination. A mechanical failure has been cited by the Texas Department of Public Safety as the suspected cause of the crash of a small airplane that claimed the life of an Ingram man and left another critically injured. According to DPS reports, John Dozier, 57, was piloting a Grumman AA-5 Traveler aircraft. Dozier was attempting to land the plane at the Gillespie County Airport. 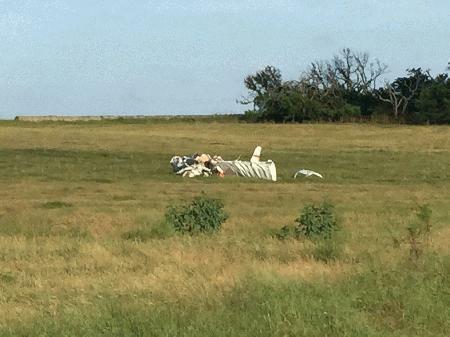 The engine lost power “on approach” and crashed in a field just short of the runway, according to DPS reports. Dozier died as the scene of the crash. A passenger, Charles Reed, 51, also of Ingram, received significant injuries and was transported to San Antonio, where he is listed in critical condition. A DPS spokesperson said troopers secured the scene and gathered information on site. A formal investigation will be conducted by the Federal Aviation Administration. One man is dead and another is in critical condition after a plane crashed Sunday afternoon in Fredericksburg. John Clifton Dozier, 57, died after a small plane crashed just short of the Gillespie County Airport runway, a Texas Department of Public Safety report states. Emergency crews responded to the accident at about 12:46 p.m.
Dozier was found dead at the scene. A second man was taken to University Hospital in critical condition, the report states. Investigators said they didn’t yet know who was piloting the plane. FREDERICKSBURG, Texas - One person is dead, another is in the hospital after a small aircraft crashed in Fredericksburg on Sunday. It is believed that the plane lost power just after take off and crashed into a field about 1,000 feet from the runway. No word on the condition of the other crash victim. NTSB is investigating the crash. President Barack Obama says climate change is a national security threat. As a result, virtually every industry is threatened by his administration’s regulatory wrath. Under the president’s watch, the Environmental Protection Agency is pushing for increased regulation of wetlands and waterways, tightening fuel efficiency standards for heavy trucks and is getting ready to launch unprecedented greenhouse gas rules for power plants. And just last week, the Obama administration announced it would be taking new steps toward regulating airplanes’ greenhouse gas emissions. The EPA proposes a declaration stating that carbon emissions from commercial planes contribute to climate change and hurt human health. The EPA is also working with the International Civil Aviation Organization to develop carbon dioxide standards for planes that would impact airlines not only in the United States, but across the globe. According to the EPA, the move “supports the goals of the President’s Climate Action Plan” to cut greenhouse gas emissions in the United States by up to 28 percent over the next decade. The environmental impact of the EPA’s proposal would be minimal — the airline industry already is moving toward ever-more-efficient aircraft and U.S.-related airplane emissions, and it produces a mere 0.5 percent of the world’s human-caused greenhouse gas emissions — but the economic harm to businesses and travelers would be severe. Rep. Lamar Smith, R-Texas, was one of many Republicans who denounced the EPA’s announcement and called any new regulations unnecessary. Sen. Inhofe is right. Jet-setting liberals are the pushiest parishioners in the Church of Climate Change. They have no problem piling up miles on their private planes to tell everyone else to make enormous sacrifices in their lives. All the radical greens who want current jetliners grounded and air travel restricted should check with their deep-pocketed donors before championing the EPA’s plan. This is lunacy, plain and simple. The EPA under President Obama is a power-grabbing bunch of authoritarians. As with everything the EPA gets its hands on, strict new airplane standards would raise costs. It would make travel more expensive and hurt airlines, business and tourism —the dominant industry in Nevada. Nevada’s congressional delegation needs to do everything in its power to block yet more costly EPA regulations — and Americans need to elect a new president who’ll finally put a leash on the EPA. 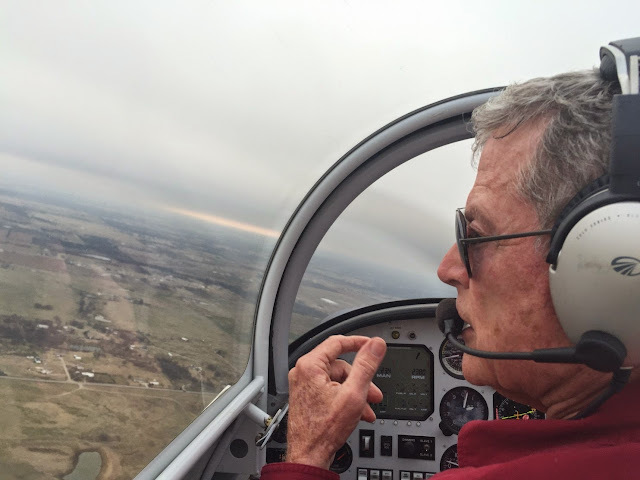 Sen. James M. Inhofe (R-Okla.) takes a reporter on a flight above Tulsa in his experimental aircraft. His faith and his conservatism shape his views on climate change, which he says is the work of God, not man. On June 14, 2015, about 1025 central daylight time, a Weatherly 620A airplane, N4659N, lost engine power near Van Horn, Texas. The airline transport rated pilot received serious injuries and the airplane was substantially damaged. The airplane was registered to Devil Dusters, Inc., and operated by Guadalupe Ag Services, Dell City, Texas, under the provisions of the 14 Code of Federal Regulations Part 137 as an agricultural flight. Visual meteorological conditions prevailed at the time. The flight was originated from the Culberson County Airport (KVHN), Van Horn, Texas. The pilot reported to the responding FAA Inspector that he was conducting spray operations on a pecan orchard. According to the pilot, the engine quit and he conducted a forced landing to a field. A post-crash fire consumed much of airframe and cockpit. An initial examination of the airplane revealed the engine had separated from the airframe and substantial damage was sustained to the right wing. A small airplane crashed Sunday south of Van Horn, injuring one person, according to a Department of Public Safety official. The plane was identified as a Weatherly 620-A, an agricultural plane. The Weatherly is a single-engine, pilot-only barnstormer, according to several web sites. A Federal Aviation Administration spokesman, contacted via email, didn't have any information on injuries or who was on board. The FAA is sending a team to begin an investigation. Van Horn is about 120 miles southeast of El Paso. The private pilot was conducting a personal cross-country flight and had filed an instrument flight rules flight plan. The flight was en route to the destination airport, and the pilot was in radar and radio contact with air traffic control (ATC) personnel. While the airplane was in cruise flight at 5,000 ft mean sea level, the pilot checked in with an air traffic controller who alerted the pilot of “moderate to extreme precipitation” 50 miles ahead and about 30 miles in diameter. The pilot acknowledged the information and stated that he would maintain communications with ATC and that he had “a scope onboard.” About 30 minutes later, the pilot reported to the controller that he was in the middle of the precipitation and was not experiencing any bumps. He also stated that his weather scope was showing some returns right of his position. About 1 minute later, radar contact with the airplane was lost, and despite multiple attempts, the controller was unable to make radio contact with the pilot. One witness reported that the airplane emerged from the clouds and that one wing had separated from the airplane before impact. Another witness reported observing the airplane above the tree line with pieces of the airplane falling toward the ground as the airplane spun and descended until impact. Postaccident examination of the engine and airframe revealed no preimpact mechanical malfunctions or anomalies that would have precluded normal operation. The wreckage distribution and signatures and the witnesses’ reports were consistent with an in-flight breakup. A review of the weather and radar data showed that, during the final moments of the flight, the airplane made a right, descending turn near an area of moderate-to-high thunderstorm activity, which can include extreme updrafts and downdrafts. Although the turn did not occur within a convective storm cell, it occurred in an area that would have been very dynamic and surrounded by hazardous weather conditions. This encounter with thunderstorm activity likely led to the pilot’s loss of airplane control and the exceedance of the airplane's design limits and its subsequent in-flight breakup. Further, based on the pilot’s communication with the air traffic controller, he was attempting to use onboard weather radar to maneuver through an area of storms that he should not have been flying through in the first place. The pilot's continued flight into thunderstorm activity, which resulted in his loss of airplane control, the exceedance of the airplane's design limits, and its subsequent in-flight breakup. Contributing to the accident was the pilot's reliance on onboard weather equipment to navigate through severe weather. On June 14, 2015 at 0746 central daylight time, a Piper PA32-300 airplane, N2966X, experienced an inflight break up and subsequently collided with trees and terrain near Cuba, Missouri. The private rated pilot and one canine passenger were fatally injured. The airplane was destroyed. The airplane was registered to LIMB-A-NATOR LLC, O'Fallon, Missouri, and operated by a private individual under the provisions of 14 Code of Federal Regulations Part 91 as a personal flight. Instrument meteorological conditions prevailed at the time of the accident and the flight operated on an instrument flight rules (IFR) flight plan. The flight departed from the Branson West Municipal Airport (FWB), Branson, Missouri, at 0701 and was en route to the Creve Coeur Airport (1H0), St. Louis, Missouri. The pilot was in radar and radio contact with the Kansas City Air Route Traffic Control Center (ARTCC). A review of the recording revealed that the accident airplane was in cruise flight at 5,000 ft mean sea level (msl), 163 knots groundspeed, and on a 050 degree heading. At 0716:09 the pilot checked in with the ARTCC controller who stated, "moderate to extreme precipitation from your 10 o'clock to 2 o'clock position beginning in 50 miles, about 30 miles in diameter." The pilot acknowledged the information and stated that he would communicate with ARTCC and that he had "a scope onboard". About 30 minutes later, at 0745:16 the pilot stated to the controller that he was in the middle of the precipitation and was not experiencing any bumps. He also stated that his Stormscope was showing some returns to the right of his position and seeing "a little bit on NEXRAD." At 0746, ARTCC lost radar contact with the airplane and after multiple attempts, was unable to make radio contact with the pilot. ARTCC attempted to relay communication through another airplane in the area; all attempts were unsuccessful. A review of the radar data revealed the accident airplane made a right descending turn during the final moments of the flight. One witness reported the accident airplane was above the tree line with pieces of the airplane falling toward the ground. The airplane's nose was pointed southeast and the airplane spun as it descended. The airplane continued below the tree line and out of sight, and then a loud crash sound was heard immediately after. Another witness heard the airplane above, but couldn't initially make visual contact because of the low clouds. The airplane descended through the clouds and the witness noticed a wing was falling separately along with other parts of the airplane. 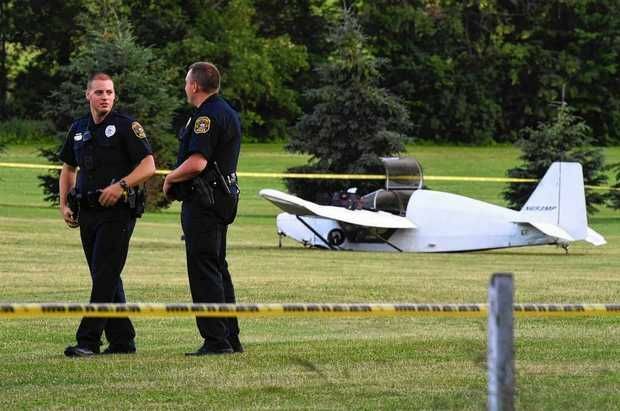 The pilot, age 54, held a private pilot certificate with ratings for single engine airplane and instrument airplane. On September 24, 2014, the pilot was issued a Federal Aviation Administration (FAA) third class medical certificate with the limitation that he must have glasses available for near vision. On the application for the medical certificate, the pilot reported his total flight experience included 1,175 hours and 60 hours in the previous six months. On November 21, 2014, the FAA Aerospace Medical Certification Division issued the pilot a time-limited Special Issuance Certificate which was valid until September 30, 2015; the pilot was treated with continuous positive airway pressure (CPAP) therapy for sleep apnea. A review of the logbook entries revealed that as of May 26, 2015, the pilot had logged 1,203.1 total flight hours, about 1,048 of which were in the accident airplane, and 3.7 hours in the preceding 90 days. On March 7, 2014, the pilot satisfactorily completed a biennial flight review (BFR) and an instrument proficiency check (IPC) in the accident airplane. Since the BFR, the pilot logged 11.3 hours in actual IFR conditions and three approaches; two instrument landing system (ILS) and one GPS. The six-seat, low wing, fixed tricycle landing gear airplane, was manufactured in 1979. The airplane was powered by a 300-horsepower Lycoming IO-540-K1G5 engine, which drove a three blade, constant speed Hartzell propeller. The airplane was inspected in accordance with a 100-hour / annual inspection and was determined to be in airworthy condition on October 9, 2014, at a tachometer time of 3,956.72 hours. Installed on the airplane was a Stormscope WX-10 Weather Mapping System. The system detected electrical discharges and mapped them on the instrument screen. The system updated continuously and automatically. The pilot stated to ARTCC that he had Next-Generation Radar (NEXRAD) onboard; however, the investigation was unable to find any evidence of NEXRAD capabilities. Maximum Structural Cruising Speed – No not exceed this speed except in smooth air and then only with caution – 149 knots indicated airspeed (KIAS). Design maneuvering speed – Do not make full or abrupt control movements above this speed – 131 KIAS at 3,400 lbs, and 114 KIAS at 2,400 lbs. At 0716 a special automated weather observation at the Rolla National Airport (VIH), located 16 miles west of the accident site, reported wind from 200 degrees at 11 knots, 3 miles visibility, light rain, mist, scattered clouds at 900 ft, broken clouds at 2,400 ft, overcast clouds at 4,600 ft, temperature 70° F, dew point 70° F, and altimeter setting 29.97 inches of mercury. At 0736 another special weather observation at VIH reported wind from 190 degrees at 8 knots, 10 miles visibility, few clouds at 700 ft, broken clouds at 3,800 ft, overcast cloud base at 4,800 ft, temperature 70° F, dew point 70° F, altimeter setting 29.98; remarks: lightning over 10 miles away to the southeast, rain began at 0657 and ended at 0731, 0.27 inches of precipitation since 0653. At 0753 a weather observation at VIH reported wind from 190 degrees at 10 knots, 10 miles visibility, few clouds at 2,300 ft, broken clouds at 4,200 ft, overcast clouds at 5,000 ft, temperature 70° F, dew point 70° F, altimeter setting 29.98, and rain in the area began at 0657 and ended at 0731. Weather radar imagery from KLSX, St. Louis, Missouri, between 0722 and 0746, depicted moderate to high reflectivity northeast of and directly in the flight path of the accident airplane. The reflectivity features were consistent with convective activity. As the airplane flew past the first area of reflectivity (between 0742 and 0745), it made a right turn in front of an area categorized by moderate-high reflectivity that had been moving southeast into the flight path of the accident airplane. At the accident airplane's final recorded position, the airplane was in a small area void of reflectivity. There were no convective or non-convective Significant Meteorological Information (SIGMET) advisories active for the accident location at the accident time. Two Airmen Meteorological Information (AIRMET) advisories were active for the state of Missouri for altitudes below 10,000 ft for the accident time. Total lightning data from the Earth Networks Total Lightning Network and Vaisala's National Lightning Detection Network did not identify the presence of any lightning in the accident area from 0730 to 0746. At 0456, the pilot requested and received an FAA Direct User Access Terminal Service (DUATS) 'Low Altitude Weather Brief' for the accident flight which contained the above weather information. The accident site was located at latitude 38° 4.706' N, longitude 91° 26.213' W, at an elevation of 995 ft msl, and 0.5 miles northwest of the Cuba Municipal Airport (UBX), Cuba, Missouri. Airplane debris was found 0.65 miles northwest of the accident site; the entire debris path extended on a 120° magnetic heading toward the main wreckage. The beginning of the debris path was identified by pieces of broken windscreen and other small airplane debris. The main wreckage, which included the fuselage, portions of the empennage, nose landing gear, right wing, and engine, came to rest in a heavily wooded area immediately adjacent to an east-west fence line. There was evidence of several damaged trees in the debris path leading to the main wreckage. The fuselage from the engine firewall aft to the tail cone exhibited impact damage and was breached and twisted. The main carry through spar on the left side exhibited upward bending signatures. All seats and associated restraints were noted and the pilot's seat was removed by first responders. All cabin and cargo doors were separated from the fuselage. All window enclosures and windscreens were missing and the remnants were found in the wreckage debris path. The instrument panel was compressed aft. The engine ignition switch position was not confirmed due to impact damage. The flight instruments were impact damaged and revealed no useful information. All switches and circuit breakers were impact damaged and their positions prior to impact could not be confirmed. The throttle quadrant levers were near the full forward position. The fuel selector valve was noted between the LEFT and OFF position. The stabilator trim wheel position could not be confirmed. The rudder trim indicator was not observed. The alternate air lever position was not determined. The two control yokes were impact damaged and the rudder pedal control bar was separated at its mounting points. The engine was located in front of the fuselage and partially covered in mud. The propeller remained attached to the crank shaft and the nose landing gear was located under the engine. One propeller blade was fractured near the propeller hub and was found near the engine. The empennage from the aft bulkhead was breached and twisted with impact damage. The vertical stabilizer was separated from the empennage, exhibited impact damaged, and breached near the center. The attachment points exhibited shear lips consistent with overstress failure. The rudder and its integral balance weight were not located. The stabilator was located in the debris path 0.27 miles from the main wreckage and separated into three sections. The right section exhibited aft and downward twisting signatures and blue paint transfer marks. The left two sections also exhibited multiple blue paint transfer marks; the inboard section was twisted and exhibited upward and downward bending signatures, the outboard section exhibited some minimal twisting. The stabilator balance weight was attached to the aft bulkhead at its mounting blocks. The left wing had separated from the airframe at the wing root and found in a densely wooded area 0.18 miles from the main wreckage. The main spar stub and the forward and aft attach fitting were sheared and bending was noted. The wing skin exhibited tree and ground impact damage. The flap was separated and found about 60 ft to the west. The aileron was attached but exhibited downward crushing at the tip. The aileron bell crank was pulled from its mount in the wing. The main landing gear assembly was intact and remained attached to the wing. The pitot tube was intact and free of obstructions. The fuel tank vent was open. The fuel cap was in place and secure. The stall warning vane moved freely. The right wing remained attached to the fuselage; the wing was twisted and the leading edge was crushed aft. The flap and aileron remained attached to their respective hinges and exhibited impact damage. The bottom of the wing was crushed up and aft. The main landing gear was in an intermediate positon and faced inboard about 45 degrees. The fuel tanks were breached and the fuel vent was completely obstructed by dirt. The fuel cap was in place and secure. The smell of aviation fuel was present at the accident site, although the exact amount could not be determined because the fuel tanks were breached. The wreckage was taken to a secure facility in Wright City, Missouri, for a postaccident examination. The engine exhibited impact damage and remained attached to the engine mounts. The crankcase near the propeller hub was fractured, which precluded the propeller from being manually rotated. The spark plugs were removed and exhibited signs of normal wear when compared to a Champion Check-A-Plug comparison card. The propeller blades were labeled A, B, and C for identification purposes in this report only. Blades A and B remained attached to the propeller hub. Blade A exhibited leading edge scoring, chord wise scratches and forward bending. Blade B exhibited a small amount of leading edge damage and forward bending. Blade C was separated about 3 inches from the propeller hub; the blade was twisted, the tip curled aft, and exhibited substantial leading edge damage and chordwise scratches. The flight control cables were observed and all were either cut during the recovery process or exhibited tension overload separations. The postaccident examination of the engine and airframe revealed no pre-impact mechanical malfunctions or anomalies that would have precluded normal operation. An autopsy was performed on the pilot by the Boone/Callaway County Medical Examiner's Office, Columbia, Missouri, on June 15, 2015. The cause of death was blunt trauma of the body secondary to an airplane crash. A full autopsy was not possible given the condition of the body; therefore, no comments can be made on factors that could have posed a hazard to flight safety. The FAA Civil Aerospace Medical Institute completed a Final Forensic Toxicology Fatal Accident Report which detected no medications, illicit drugs or alcohol that could pose hazards to flight safety. FAA Pilot Handbook of Aeronautical Knowledge - Chapter 11, "Weather Theory"
"…if an aircraft enters a thunderstorm, the aircraft could experience updraft and downdraft that exceed 3,000 ft per minute…a good rule of thumb is to circumnavigate thunderstorms by at least 5 nautical miles…if flying around a thunderstorm is not an option, stay on the ground until it passes." FAA FAASTeam "Thunderstorms – Don't Flirt…Skirt 'Em"
• Never get closer than 5 miles to any visible storm cloud with overhanging areas, and strongly consider increas­ing that distance to 20 miles or more. You can encounter hail and violent turbulence anywhere within 20 miles of very strong thunderstorms. • Do not attempt flight beneath thunderstorms, even when visibility is good, because of the destructive potential of shear turbulence in these areas. • At the first sign of turbulence, reduce airspeed immediately to the manufacturer's recommended airspeed for turbulent air penetration for a specific gross weight (design maneuvering speed). • If the aircraft inadvertently penetrates the thunderstorm, maintain a straight and level altitude on a heading that will take you through the storm area in the minimum time. On June 14, 2015 at 0746 central daylight time, a Piper PA32-300 airplane, N2966X, impacted terrain near Cuba, Missouri. The pilot and one dog were fatally injured. The airplane was destroyed upon ground impact. The airplane was registered to and operated by LIMB-A-NATOR LLC, O'Fallon, Missouri, under the provisions of 14 Code of Federal Regulations Part 91 as a personal flight. Instrument meteorological conditions prevailed at the time of the accident and the flight operated on an instrument flight rules flight plan. The flight departed from the Branson West Municipal Airport (FWB), Branson, Missouri, at 0701 and was en route to the Creve Coeur Airport (1H0), St. Louis, Missouri. The pilot was in radar and radio contact with the Kansas City Air Route Traffic Control Center (ARTCC). A preliminary review of the recording revealed that the accident pilot was in cruise flight at 5,000 feet mean sea level (msl) and acknowledged the weather in the area. At 0745 he stated that he observed the weather on his Stormscope equipment and added that he was "getting no bumps, just [precipitation]." At 0746 the ARTCC lost radar contact with the airplane and after multiple attempts was unable to make radio contact with the pilot. Another flight was in the accident area on a similar heading at 7,000 feet msl. At 0749 the pilot made several unsuccessful attempts to contact the accident pilot on the radio. One witness reported observing the accident airplane above the tree line with pieces of the airplane falling toward the ground. The nose was pointing toward the southeast and the airplane spun as is descended. The airplane went below the tree line and out of sight. A loud crash sound was heard immediately after. Another witness heard the airplane above but couldn't see it because of the low clouds. The airplane descended through the clouds and the witnesses noticed one wing was falling down along with other parts of the airplane. At 0716 a special automated weather observation at the Rolla National Airport (VIH), located 16 miles west of the accident site, reported wind from 200 degrees at 11 knots, 3 miles visibility, light rain, mist, scattered clouds at 900 feet, broken clouds at 2,400 feet, overcast clouds at 4,600 feet, temperature 70° F, dew point 70° F, and altimeter setting 29.97 inches of mercury. At 0736 another special weather observation at VIH reported wind from 190 degrees at 8 knots, 10 miles visibility, few clouds at 700 feet, broken clouds at 3,800 feet, overcast clouds at 4,800 feet, temperature 70° F, dew point 70° F, altimeter setting 29.98, and distant lightning to the southeast. At 0753 a regular weather observation at VIH reported wind from 190 degrees at 10 knots, 10 miles visibility, few clouds at 2,300 feet, broken clouds at 4,200 feet, overcast clouds at 5,000 feet, temperature 70° F, dew point 70° F, altimeter setting 29.98, and rain in the area began at 0657 and ended at 0731. 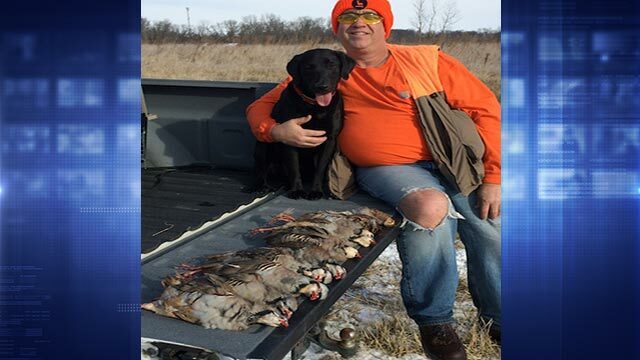 Jeffery Hansen, 54, and his dog were killed during a plane crash Sunday morning. 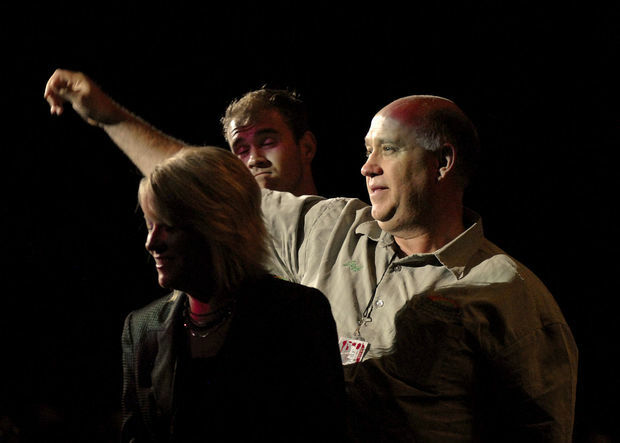 Jeff Hansen of Hansen's Tree Service at an event at Family Arena in St. Charles on Oct. 7, 2011. A St. Charles man and the family dog perished Sunday morning when a small, single-engine plane crashed in a wooded area near the Cuba, Mo. airport during a severe storm. He is Jeffrey B. Hansen, 54, who was the only person on board. Hansen owns a well-known O'Fallon, Mo.-based tree service company that also has a location in Branson. The plane, a Piper PA-32, went down about 7:45 a.m. in Crawford County, about three-quarters of a mile north of the airport, said Sgt. Cody Fulkerson, a public information officer with the Missouri Highway Patrol. Fulkerson said two witnesses had independently contacted him and said they saw the plane splitting up in the air. "There were severe storms in the Rolla area at the time the plane went down, and the storms definitely have the capability of tearing up a plane," he said. "Both said that it sounded like the engine was in distress. When they looked up it came out the clouds and was breaking up." Hansen's son and some family friends traveled to the crash site Sunday immediately after hearing the news. Fulkerson said that according to Hansen's son, Hansen had texted his wife, "saying that he was in very bad weather and that there was lots of turbulence." Flight records show that Hansen took the plane from Creve Coeur Airport to Branson West Municipal on June 3. Fulkerson said Hansen was flying Sunday from Branson to Creve Coeur. Records show that he took off at 7:01 a.m. The Federal Aviation Administration was on the scene investigating and representatives from the National Transportation Safety Board were expected to arrive from Dallas Sunday afternoon, Fulkerson said. "These things are always tragic," he said. "The hardest thing a trooper has to do is give a death notification." Fulkerson said that the family did not want to talk at this time. He had no further information about the family dog. Hansen, founder and president of Hansen Tree Service and Environmental Wood Resources Inc., started his tree service company in 1988, according to the company's website. In 2005, the company became the first in Missouri to be certified by the Tree Care Industry Association. It now employs about 90 people including 10 International Society of Arboriculture-certified arborists. The tree service operates a fleet of 75 trucks and has diversified into numerous related services. This was the second fatal plane crash in the area around Rolla in three days. On Friday morning, four members of a Utah family who were visiting relatives near Success, Mo., were killed when their plane crashed on take-off from a private grass airstrip. The Beechcraft A-36 got about 100 feet off the ground before stalling. C. Mark Openshaw, 43, a member of the Utah education board since 2008, and his family were returning to their Provo, Utah. Other victims were Openshaw's wife, Amy, 43; their 15-year-old son, Tanner; and 12-year-old daughter, Ellie. The lone survivor is a 5-year-old child who is recovering in a hospital in Springfield, Fulkerson said. The father was a well-known educator in Provo. "That happened on the private property of the grandfather, and he saw it happen," Fulkerson said. CHERRY TWP. — A pilot and passenger were injured Sunday when their plane crashed shortly after takeoff in Sullivan County, state police at Laporte said. Pilot Richard Rexer, 55 and passenger John Smithkors, 58, both of Dushore were taken to area hospitals for possible back and neck injuries, state police said. The Stinson 108 Voyager airplane crashed into a wooded area at 8:10 a.m. approximately 140 feet north of Airport Road and approximately two-tenths of a mile from Gainer Hill Road, state police said. Emergency response personnel from Mildred and Dushore located the crash victims, treated them at the scene and transported them to the hospitals, state police said. LE BOURGET, France—A key engine supplier to Airbus Group SE and Boeing Co. is urging the two plane makers to move cautiously in boosting output of their most popular single-aisle jetliners, with demand already stretching production capacity. 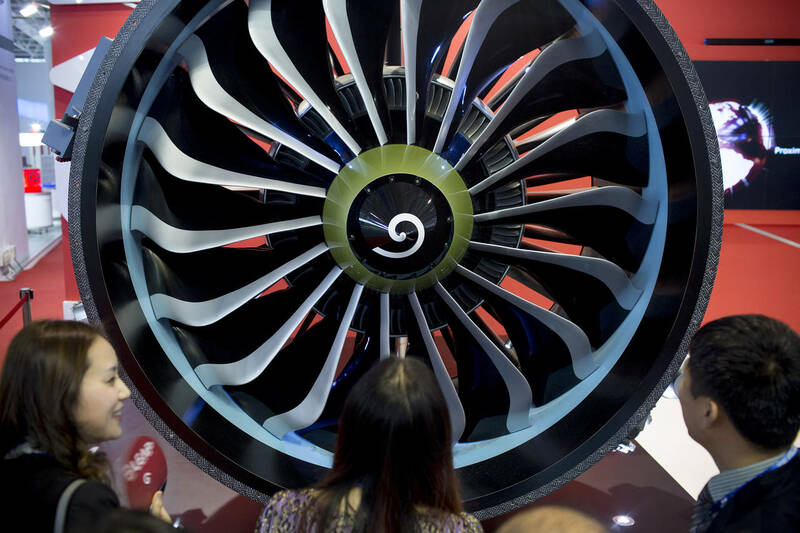 “There are restrictions to how fast we can ramp up,” said François Bastin, executive vice president at CFM International, a joint venture of General Electric Co. and Safran SA, ahead of the coming week’s Paris International Air Show. Airbus and Boeing have seen huge demand for their newest single-aisle planes, which form the backbone of global airline operations. Airbus will this year introduce the A320neo, an updated model of its popular jetliner with engines produced by United Technologies Corp. ’s Pratt & Whitney unit. Next year, it will deliver a version of the plane equipped with CFM engines. Boeing’s 737 Max jetliner is due to enter service powered entirely by the Franco-American joint venture’s engines in 2017. Both aircraft manufacturers plan to boost single-aisle output further. Boeing is increasing to 47 planes a month in 2017 from 42 currently and Airbus is advancing to 50. Boeing will boost again to 52 in 2018 and both have indicated output may rise again by the end of the decade. Airbus said it may decide this year to lift production. CFM has amassed orders for more than 8,900 engines across the Airbus and Boeing models, as well as China’s Comac C919. When it hits its planned manufacturing tempo, the joint venture aims to build a new Leap engine at a rate of one every five hours, according to the company’s global manufacturing plan. Allen Paxson, another executive vice president at CFM, said the company could support higher single-aisle plane output in the near term if that included current versions of the Airbus A320 and Boeing 737 powered by engines that have been in production for decades. To keep pace with its plane-maker customers, the company is modernizing its manufacturing processes at assembly lines in France and the U.S., including the introduction of a so-called pulsed line, on which engines move during the build process at specific time intervals. The joint venture is focusing intently on ensuring that each one of the more than 4,000 unique parts inside each engine comes together smoothly. Mr. Bastin said the new engine would deliver the fuel-burn performance and other features promised to customers. “It is right on target and it will be right at the performance at entry into service,” he said. The Leap-1A-powered A320neo test plane is now flying as often as twice a day.